In this article we will learn about the annotations that are used to create tables per class and sub – class and how to create an application using table per sub – class strategy in hibernate. An inheritance is the way of inheriting parental properties into its sub classes or derived classes. In Hibernate, Inheritance is used among database tables. By default, Inheritance works for single class table strategy and creates a single table for its parent and sub classes. In Hibernate, we can also create multiple tables or tables per class and sub class strategy or for table join relationship. In this article, we are going to talk about “Table per class Strategy”. We shall use few kind of annotations that will help us to create “Table per class Strategy” by inheritance. In this case, We will have to define the InheritanceTyp1e to TABLE_PER_CLASS strategy. And there is no need to define any DiscriminatorType Column in the base class and DiscriminatorValues in the sub – classes. All the classes should be defined as an Entity class. The above code defines a Vehicle class that declares two class member variable of Int and String type with its getter() and setter() methods. This class is defined as an entity class using @Entity annotation. This annotation is defined in javax.persistenc package. The next annotation @GeneratedValue is used to insert auto – incremented record in id column of database table. Now define a sub – class TwoWheeler of Vehicle base class as an entity class. 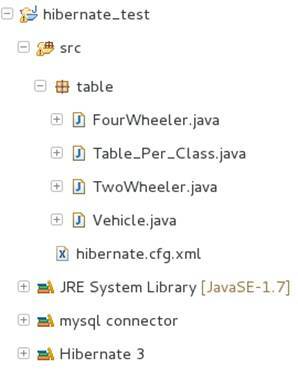 This class will create a new table into the database as “TwoWheeler” by inheriting base class properties as listed in Listing 2. The above code defines a TwoWheeler class that extends Vehicle class. This class inherits the properties of Vehicle base class and declares a String type class member variable with its getter() and setter() methods. This class is defined as an entity class using @Entity annotation. Hence, It will create a separate table into the databaes by name “TwoWheeler”. The above class defines a FourWheeler class that inherits the properties of Vehicle base class. It defines a String type class member variable with its getter() and setter() methods. This class is defined as an entity class using @Entity annotation. Hence, It will create a separate table into the databaes by name “FourWheeler”. The above coding defines the Table_Per_Class strategy type. This class defines a main() method. This method declares instances for class Vehicle, TwoWheeler and FourWheeler classes to initialize class member variables. It also defines an instance of Configuration class type that call configure() method to read hibernate-cfg.xml configuration file. Now, Crate an instance of SessionFactory class using method buildSessionFactory() method of Configuration class. Using SessionFactory instance, call method openSession() and assign its reference to Session class type instance. The SessionFactory instance is created for once for an application and a session instance is created for every time, whenever database communication is required. Now to save entity class objects into the database, call beginTransaction() method and call save() methods for each entity objects. Once we have saved these objects into the database, commit the opened transaction using method session.getTransaction.commit() and close the session using method close(). 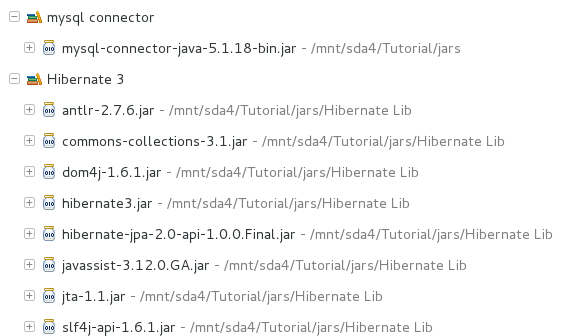 The above code defines hibernate configuration file. This code define tag to inform the hibernate about the set of entity classes that will be manipulated as entity type for hibernate. In this article, we learn about all different kind of Inheritance strategies provided for hibernate to create database tables in different ways. We also created an example for TABLE_PER_CLASS strategy of inheritance.